We report a 3-month-old girl who presented with high-grade fever for 3 days. Her initial physical examination was normal. Investigation showed abnormal white cells in her urine. She was diagnosed with a urinary tract infection and received an antibiotic for 1 day. After that, she developed a generalised maculopapular rash over her body. An adverse drug reaction from the antibiotic was suspected, and the patient was referred to our hospital. On admission, she still had fever and was irritable. She was diagnosed with sepsis and given another broad-spectrum antibiotic for 2 days. However, her fever still persisted. An additional thorough physical examination showed redness of her BCG inoculation scar. Consequently, a diagnosis of Kawasaki disease (KD) was made. After she received intravenous immunoglobulin, her fever diminished straight away. This case highlights an unusual manifestation of KD in an uncommonly young age group. Since it is challenging to establish a diagnosis, coronary artery complications occur frequently in infants with KD.5 To prevent such harmful consequences, paediatricians can treat patients with KD through intravenous immunoglobulin (IVIG) infusion within 10 days of onset of the disease.6 IVIG can decrease the risk of coronary artery abnormalities from 25% to 5%.5 Our patient was diagnosed rapidly enough and received IVIG in good time, so she had no residual coronary artery complications. Persistent fever can be caused by infectious and non-infectious diseases. Infectious diseases may be caused by bacteria, viruses, fungi or parasites. In this case, we gave her broad-spectrum antibiotics, but her symptoms did not improve indicating that bacterial infection was less likely. We therefore also included other micro-organisms and non-infectious diseases such as autoimmune diseases or neoplasm in the differential diagnosis. KD should also be considered as a differential diagnosis in cases of persistent fever especially in children under 5 years. A detailed history and physical examination are required to reveal the cause of persistent fever. 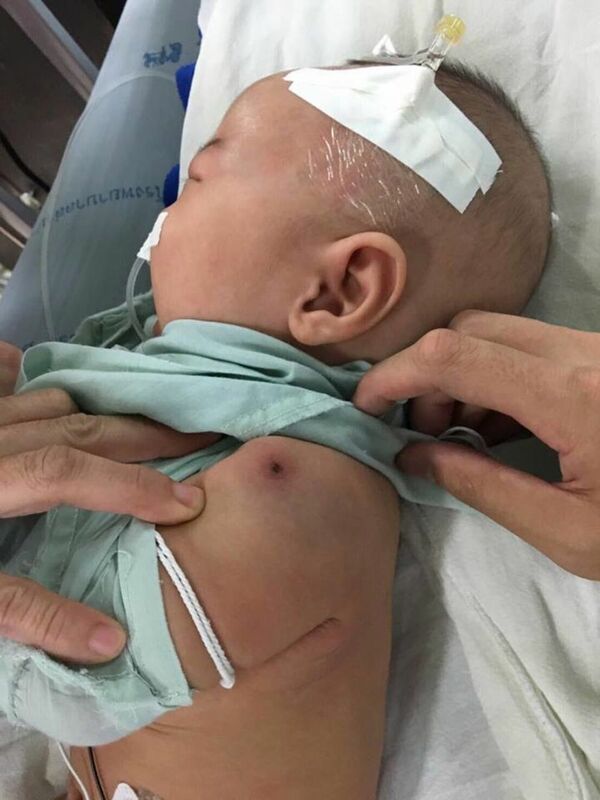 A 3-month-old infant from northern Thailand presented with fever for 3 days. She was a healthy term infant. She received BCG vaccination at birth. Her vaccination was completed according to Thailand’s national immunisation programme. Before she was referred to our hospital, she was admitted to a primary care hospital due to high-grade fever together with poor intake. Investigations for the source of the infection were conducted. Her urine examination showed a concentration of white cells of 20–30 cells/high-power field (hpf). As a result, she was diagnosed with a urinary tract infection. She was given ceftriaxone. After that, she developed a generalised maculopapular rash, so a ceftriaxone allergy was suspected. She was referred to our hospital. On the first day of admission to our hospital, physical examination revealed high-grade fever (39˚C), a heart rate of 155 beats per minute and a respiratory rate of 32 breaths per minute. She looked irritable. She had erythematous lips and a mildly injected pharynx. She had no erythema of the palms or soles. Other systems were within normal limits. We thought of sepsis, so we gave her meropenem. However, the fever still persisted after 2 days of the antibiotic. We repeated the physical examination and found that she had redness and induration around her BCG scar (figure 1). She had neither conjunctival injection nor cervical lymphadenopathies. Redness and induration around her BCG scar. A complete blood count revealed a haemoglobin concentration of 10.7 g/dL, haematocrit of 32.1%, a mean corpuscular volume of 83.1 fL and a white cell count of 23.7 x 109/L with 66% neutrophils, 22% lymphocytes and 3% monocytes. The platelet count was as high as 450 x 109/L. The erythrocyte sedimentation rate (ESR) was 19 mm/hour. C reactive protein (CRP) was elevated to 130.7 mg/L. The liver function tests revealed a total bilirubin of 0.3 mg/dL, direct bilirubin of 0.1 mg/dL, aspartate aminotransferase of 38 U/L, alanine transaminase of 21 U/L, alkaline phosphatase of 111 U/L, total protein of 5.3 g/dL, albumin of 3.3 gm/dL and globulin of 2 g/dL. Urinary analysis showed a white cell count of 20–30 cells/hpf with 1–2 epithelial cells/hpf. The cerebrospinal fluid profile was normal. All cultures from catheterised urine, blood and cerebrospinal fluid were negative. Echocardiography showed no anatomical cardiac defect. The coronary arteries were normal sized: the left main coronary artery was 1.7 mm, left anterior descending artery 1.7 mm, left circumflex artery 1.2 mm and the right coronary artery 1.8 mm. There was normal left ventricular function and trivial mitral valve regurgitation without pericardial effusion. Incomplete KD (two clinical criteria of red lips and polymorphous exanthem). On additional physical examination, erythema induration at BCG inoculation site plus three supplementary laboratory criteria of white cells ≥15 000 cells/mm3, urine white cell count ≥10 cells/hpf and platelet count ≥450 000 cells/mm3). The patient received IVIG 2 g/kg and aspirin 80 mg/kg/day on her seventh day of fever. After administration of IVIG and aspirin, the fever dramatically defervesced in the following 24 hours. The infant was discharged 48 hours later. Her vaccination programme was postponed for the next 11 months to avoid live attenuated vaccines. Aspirin was prescribed at an antithrombotic dose for 8 weeks. A follow-up echocardiography showed normal coronary arteries. The right coronary artery was 1.2 mm, the left main coronary artery was 2 mm and the left anterior descending artery was 1.5 mm. At follow-up examination, she had no periungual peeling of fingers or toes. In our case, the patient was only 3 months. She had BCGitis, polymorphous exanthem, persistent fever even after infusion with several antibiotics, a sterile pyuria and thrombocytosis which provided the clues for a diagnosis. She had neither cervical lymphadenopathy, changes in extremities nor conjunctival injection. Fortunately, IVIG was given within 10 days of the onset of the disease and so she had no coronary artery complications. Kawasaki disease (KD) should be considered in infants less than 6 months even though the incidence is low in this age group. Careful physical examination is important. If BCGitis is found in febrile children without a source of infection, consideration of KD is warranted. Early diagnosis of KD and administration of intravenous immunoglobulin could reduce the risk of coronary artery complications.
. Kawasaki disease in infants three months of age or younger. J Microbiol Immunol Infect 2006;39:387–91.
. Nelson textbook of pediatrics. 20th edn. Philadelphia: Elsevier, 20161209–14. Contributors AW: picked a topic, made an outline and revised the manuscript. NL and AW: researched and wrote the paper. Patient consent Gaurdian consent obtained.